What is Islam And Muslim ? Islam is an Arabic word which means peace, purity from Shirk (associating partners with Allah) , acceptance and commitment. As a religion, Islam stands for the complete submission and obedience to Allah (God Almighty). The specific acts of worship, termed the pillars of Islam, provide the structure of spiritual life. 3. Siyam - Fasting : in the month of Ramadhan. This means abstention from food, drink intimate martial relationship from dawn to sunset. It teaches one to love, be patient, unselfish and develops will power. 4. Zakah - Almsgiving :obligatory charity - an annual payment of 2.5% of one's net savings as purifying sum to be spent on poor and needy. 5. Hajj - Pilgrimage : To make pilgrimage (Hajj) to the sacred house (Ka'bah), for whoever is able to do so. The Noble Quran has been translated into the modern English Language. To enable the English reader to understand clearly the meaning and the aim of the Qur'an. Quran Explorer : Recitation and Translation in Arabic, English, and Urdu. 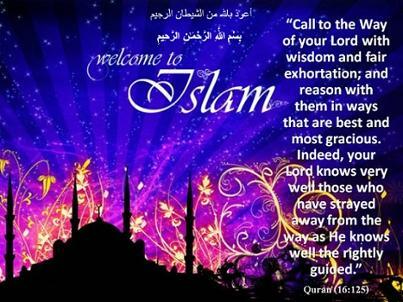 Welcome to Islam Question & Answer! This site aims to provide intelligent, authoritative responses to anyone’s question about Islam, whether it be from a Muslim or a non-Muslim, and to help solve general and personal social problems. Take responsibility to check whether you and your family consuming everyday products are Halal . Click on the link below to find out more.